This live performance is fairly slow even by the standards of conductor Hans Knappertsbusch; elsewhere he settles at timings around 250 minutes. That said, this performance certainly does not noticeably drag even though the following year Clemens Krauss went for a leaner, more propulsive Parsifal. That 1953 season also benefited by the arrival of Rita Streich as First Flower Maiden and the replacement of Wolfgang Windgassen by Ramon Vinay. Windgassen here reprises the role of Parsifal with considerable success, even if he is not ideally suited to the character by timbre or temperament. There are few changes here from the more celebrated issue of the inaugural performances a year earlier. That was a composite recording devised from two live performances, patched from the general rehearsal; this one is simply a faithful recording of how it was on the night of the 1 August 1952. The only important cast change here from 1951 is the substitution of Kurt Böhme for Arnold Van Mill as Titurel, a relatively small role. Böhme is adequate if rather rough. Martha Mödl, Ludwig Weber, George London and Hermann Uhde are common to all three seasons (1951-53). Thus, apart from noting the pace of Krauss compared with the profundity of Knappertsbusch and the relative merits of two rather different Parsifals, we are largely comparing like with like when looking at all three consecutive Bayreuth runs. In truth, all are monuments to the supremacy of Bayreuth following its post-war revival in 1951 and for me their greatest drawback resides in the Gurnemanz. I can not only tolerate but positively enjoy the old boy’s extended monologues if they are delivered by a bass of sufficient beauty such as Kurt Moll, Robert Lloyd or Hans Hotter in his prime, but I find Ludwig Weber rather dull and rocky. He barely copes with Gurnemanz’s highest notes, as on “seinem Haupt” when he baptises Parsifal. Having said that, I concede that he is at his best in 1952, steadier and presiding here with grave authority. Windgassen barks and strains a bit, too often employing guttural emphasis where Vickers and Vinay have the strength of voice to suggest extreme emotion without resorting to the “Bayreuth Bark”. 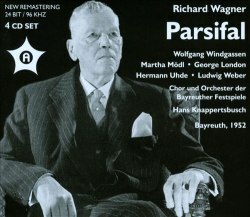 However, Windgassen copes more easily than they with the higher, gentler passages such as when Parsifal blesses Kundry. Mödl’s performance remains a tour de force, the slightly curdled and husky tone not being inappropriate to the bestial Kundry. The close of Act II is electrifying and Windgassen rises nobly to do justice to Parsifal’s destruction of Klingsor’s enchanted fortress. About George London’s Amfortas I can only recycle superlatives: he maintains great beauty of tone while sounding utterly distraught, first with guilt and secondly with grief over his father’s death. His cries of “Erbarmen!” are heart-rending and yet strangely lovely. Uhde is crazed, febrile and utterly compelling as Klingsor. The Bayreuth chorus is terrific - much better than ten years later for the same conductor. The 24 bit re-mastered sound is really very good for a live recording over sixty years old and the coughing less aggravating than a year later with Krauss at the helm. This remains a wonderful memento of a golden age at Bayreuth but for me does not rise to the heights of the greatest performances, which field a better Gurnemanz and Parsifal.